Tonight the Trane sponsored Basingstoke Bison play Streatham in the second leg of the NIHL South 1 Britton conference Play Off Quarter Final. Last nights first leg ended with a Bison win by 5 goals to two which gives the Herd 3 goal lead going into tonight�s second leg. Don't forget, you can now print your tickets off at home in advance or show them on a smartphone device to gain entry to the rink. The rink bar will be open all evening long, with Papa John's will once again be producing freshly made pizzas. You can order in advance before the game so your delicious piping hot pizza is waiting for you in one of the intervals or at the end of the game. There�s no need to rush to eat before heading to the arena when you can grab a delicious Papa John�s during the game. Our weekly Twitter competition will once again be up running in conjunction with Papa John�s where fans choose who they think will be the Bison�s first goal scorer and one lucky winner wins a large pizza. Keep your eye on Twitter on Saturday to enter. 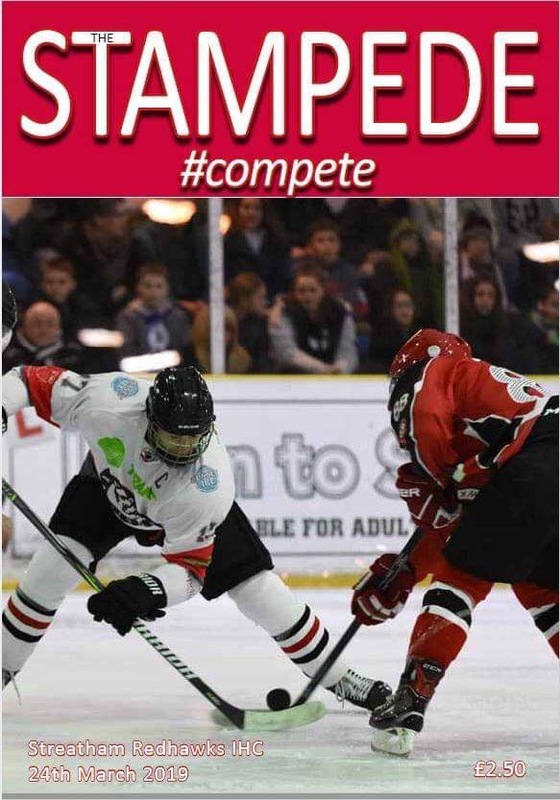 Tonight�s Stampede match night programme contains all the information hockey fans love to know. Coach Tait gives his thoughts on the last week of Bison hockey and what Play Off hockey is all about. Nigel Simmonds Weekly Round Up gives Nigel�s takes on last weekend�s games. and Anthony Russell is back with more of the weekly rundown on all things league related. As always, The Stampede is your definitive destination for club and league stats as well as your official scoresheet. The ever popular 50/50 draw will be running tonight, with one lucky winner each week taking home a huge cash prize. Tickets cost just �1 and are available from our roving sellers and at the Merchandise Club table. Shirt Off the Player�s Back: is just a �1 ticket you could win the Banners On the Wall Bison Player of the Year George Norcliffe�s Bison home jersey. With the added bonus that George will present the jersey to you after the game on the ice. Tickets will be available from the Booster Club table. Chuck-a-Puck:, in association with Zizzi�s restaurant is once again back for another season so grab your puck for just �1 head to the players� benches after the second period and aim for the centre of the rink and you could win a �40.00 food voucher to use at the restaurant! Chuck-a-Duck in association with Ma Humbugs so grab your ducks for just �1 head to the players benches after the second period and aim for the centre of the rink and win yourself a bag of Ma Humbugs sweets.